The inland waterways were absolutely critical to the demographic and economic development of the eastern part of the United States, especially from 1820-1940. Before World War II, Great Lakes shipping exceeded the tonnage of U.S. Pacific Coast shipping (see hi-res map here). World War II and the beginning of the Cold War led to a consolidation of naval power for the United States and its allies, greatly expanding Pacific shipping trade and spurring fast-developing economies countries. Great Lakes shipping dramatically declined, in part because steel production has gone to lower-cost producers that were connected to the U.S. economy through the expanded trade. Some could see irony since the steel warships created from the Great Lakes manufacturing enabled expanded Pacific and Atlantic trade that led to the decline of Great Lakes manufacturing and regional struggles in the rust belt. Still, more than 200 million tons of cargo, mostly iron ore, coal, and grain, travel across the Great Lakes annually. This deindustrialization clearly is a huge economic negative but the environmental impacts for lakeside communities has been enormous. Industrial emissions in the watershed and shipping pollution in the lakes went down as waterfowl populations returned and more waterfront property became swimmable again. 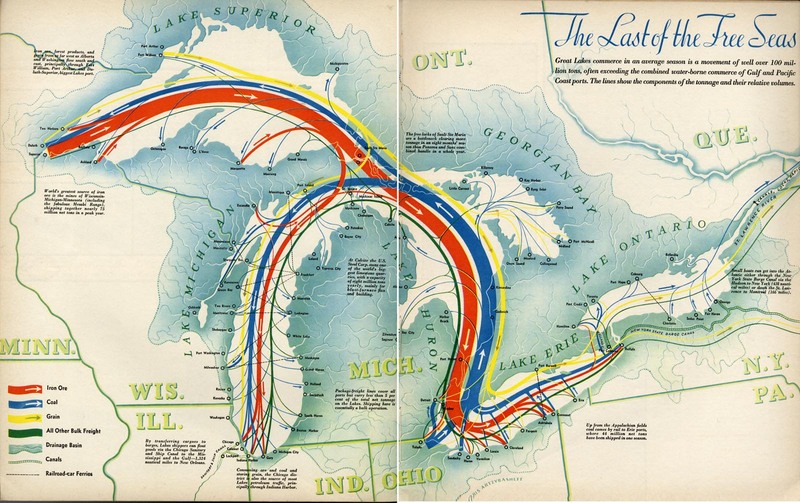 Still this map of the environmental stress on the Great Lakes shows they are far from pristine. Tags: environment, historical, water, resources, transportation, industry, economic, regions, globalization.